The Langston High School Continuation Program offers students an alternative way to earn a high school diploma. Although students are responsible for the same course requirements, number of credits, and SOL assessment verification as students in the comprehensive high schools, the program offers flexibility in the way and timeframe in which students can earn a high school diploma. Students are able to earn eight or more credits in a year. Classes are semester-based, and students may complete one, two, three or four classes each semester, allowing for credit recovery or acceleration. The financial cost to the student varies with age. Students elect to attend Langston or may be referred by the comprehensive high schools. 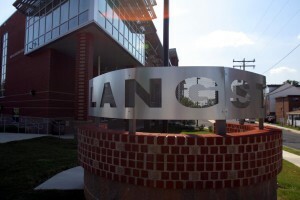 Students must be at least 16 years of age to enter Langston; there is no upper age limit. Online classes are available for all students. Upon completion of requirements, students receive standard or advanced-studies high school diplomas from their home schools. College credit is available for some courses from Northern Virginia Community College (NVCC) through a dual enrollment program. As a result of working in a program that is kept small by design, teachers and staff have developed a supportive and individualized atmosphere. Teachers are skilled at teaching students with diverse needs and learning styles in multiple levels or subjects within one classroom.